IS THERE ANYTHING MY CHILD WILL EAT? The first time I encountered a child with a food fetish, I thought his parents were joking. Their son, they explained, a well mannered, handsome twelve year old refused to eat anything but bagels and cream cheese. No meat, no chicken, no fruit, no veggies, no pasta, no rice, no cake, no juice. According to his mom, he had been drinking milk and eating bagels and cream cheese exclusively since he was a toddler. I thought he would “grow out of it.” I was wrong. He persisted following this bizarre diet throughout high school. No amount of coercion or persuasion by parents or doctors could change his eating habits. It wasn’t until he went off to college that he attempted to change. What happened? Away at school, he realized that he was considered “odd” and, finally, at the age of nineteen, asked me to refer him to a psychologist for help. With help, his eating habits eventually normalized. A good outcome at last but, who knows what arterial damage his years of cream cheese brought? Eating properly is more than a social skill, it’s the foundation for a healthy life. Lots of kids are fussy eaters. Don’t worry about their eating habits, they’ll outgrow them. Just make sure they eat something, it doesn’t matter what it is. Bad idea! Pediatricians are challenged on a regular basis by children with compulsive eating habits. The food chosen by the compulsive eater varies from child to child, being as bizarre as Fruit Loops or Captain Crunch to more common items such as macaroni and cheese, peanut butter, frankfurters, chicken nuggets or french fries. And, of course, these kids never eat vegetables and almost never any finned fish. Parents of these food fetish children invariably yield to their children’s demands, thinking it’s only a “phase” and choosing to go along with desires of the child rather than face conflict at meals or refusal to eat entirely. This parental passiveness only reinforces the child’s fixation on his bizarre and unhealthy diet, often leading to a lifetime of unbalanced, unhealthy eating. Not all children will eventually see the light as the “bagel boy” luckily did. I’ve encountered adults who confessed to me that they can’t eat in public because the sight of “normal” food actually makes them ill. What a life! Lopsided eating isn’t only a social liability, it’s a threat to health. It’s well recognized that a balanced diet consisting of vegetables, fruit, nuts, fish and dairy promotes good health and, according to some studies, a longer life by more than a decade. Diets high in saturated fats promote atherosclerosis and heart disease, even in the arteries of children and teens. Vegetables and fruits are sources of anti-oxidants, substances which protect against heart disease and cellular damage. Children who are allowed to grow older with unhealthy eating habits often continue these horrendous patterns throughout adulthood, suffering from obesity, suboptimal health and, in some, premature death. Why don’t all children eat what they are given? They’re never hungry. The reason? Snacks. Well-meaning parents are often intimidated by their children’s refusal to eat. These poor parents allow themselves to be bullied and yield to their kids’ desires by giving them unhealthy snacks, high in fats and sugar, throughout the day. Naturally, when lunch or dinner is served, the kids have no appetite, vegetables and healthy proteins are rejected on sight. Faced with this rebellion, mom compounds the nutritional disaster by becoming a short-order cook, removing the offensive healthy meal and replacing it with macaroni and cheese, hot dogs, french fries or chicken nuggets. Afraid her children will starve if they refuse the food on the table, wanting to avoid a mealtime struggle, she unwittingly perpetuates an unhealthy routine. Children are best served by three healthy meals daily consisting of a blend of protein, carbohydrates and fats. Snacking is unnecessary both from a nutritional and an energy pick-up standpoint. Yet, in our society, snacks have become woven into the daily routine of many families. Therefore, it is important that those snacks are healthy, consisting of fruit or vegetables and never given closer than three hours before the next major meal. Snacks which are high in sugars or fats are appealing to most children but are unhealthy and lessen the desire to eat good food. How do we handle kids who only want chicken nuggets or French fries? This situation is unhealthy and parents must deal with it in a gentle but firm manner. Healthy foods, especially vegetables and fruits, must be placed on the child’s plate at least once daily even though they may be rejected. Yelling or coercion should definitely be avoided. A simple statement declaring “gosh, that’s what’s for dinner” gives a non-hostile message that the meal presented is not negotiable. Surrendering to screaming, tantrums or refusal to eat by supplying the child with his desired “junk” is a bad precedent both for the table and for life. If the child refuses to eat this meal, he will be hungrier for the next. He won’t starve and he won’t become dehydrated. Studies have shown that children will eventually accept healthy foods if they are placed before them repeatedly. Of course, foods must be varied. The same carrots or spinach on the plate every night will be a definite turn-off. What about kids who are “rewarded” with snacks throughout the day? Even if the snacks are healthy, the end result may be a lifestyle of self gratification through eating. Children who have been brought up expecting food when bored, cranky or idle often have problems developing social skills, becoming physically fit or learning to be self sufficient or creative. After all, rather than being active and learning to amuse themselves, these children just get something to eat. When food is made the primary focus of the waking hours, social skills suffer, the children constantly seeking gratification through eating. There are many unhealthy, obese adults who wish they had been brought up differently. Learn to control the timing and quality of snacks and always offer healthy foods to your children whether they want it or not. Kids don’t get heart disease from cholesterol. Whoever heard of a kid getting a heart attack? Let them eat what they like, you can worry when they get older. Wrong, wrong, wrong. Not only can children have high cholesterol, some have evidence of atherosclerotic heart disease by the time they are three years old. Autopsies of “healthy” kids after automobile accidents have revealed coronary artery lesions in early adolescence. Think about this: heart disease can start in childhood. Does that mean that parents have to lock their children in the house and feed them nothing but oatmeal? Obviously not, since we know that good health can come from eating a wonderful variety of fun foods and being active. Foremost in the minds of parents should be a “foods to avoid” list consisting of any items high in fat and sugars. The American Heart Association has established the guideline that fat Calories should make up less than 30% of the total diet, much of that fat being unsaturated. Without having to take a calculator to the store, parents can generally feel safe if their kids’ total daily fat intake is between 50 and 75 grams, starting at age two and ending at age 10. And how can you tell how much fat you’re buying? Read the labels and do a little simple arithmetic. If your child’s magic number is 60 grams of fat per day, you might be impressed that a single slice of pizza contains 10 to 20 grams, some ice cream bars contain 40 grams and some cheese snacks contain, omigosh, 60 to 70 grams of fat in a single bag! Kids who eat lots of cheese, hot dogs, fried chicken, fast foods, ice cream and cookies are living dangerously. As a rule of thumb, any single serving of more than 10 grams should be given extra thought before presenting it to your child. What’s good to give your kids? Try cereals and whole-grain breads, yogurt, low-fat cheeses and milk, soups with veggies, rice, fresh fruit, chicken, ham or turkey meats, canned tuna, fresh fish, and varieties of vegetables, both raw and cooked. 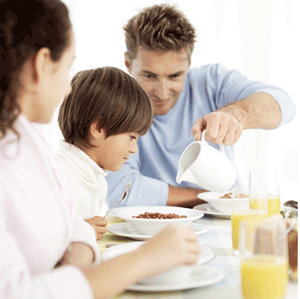 The most important thing to remember is that parents must be in control of the eating patterns of their children. Good health and longevity are, in many ways, determined by the kinds of food we eat. Children often want foods that are dangerous to their health and it is our job to steer them to a lifestyle that includes healthy eating. Foods and snacks that are high in saturated fat can lead to heart disease even in small children. Parents must make smart choices for their children, avoiding those foods which can pose a risk to health. You know why your kid is so jumpy and nervous? It’s the sugar in his food. If you want him to calm down, you’d better change the way he eats. Your child may be jumping off the walls, but you can’t blame it on the sugar in his diet. It’s a myth. Sugar does not cause hyperactivity. In fact, studies have shown that there is no connection between sugar and hyperactive behavior. When brain metabolism is analyzed, the findings indicate that sugar has the opposite effect, that is, it actually produces a sedating effect on the brain. Surprised? Does that mean that you can now load your children with sugary treats? Of course not. Children who eat a lot of sweets suffer from poor nutrition, usually sacrificing vegetables, fruits and fish to their craving for sugar. And in those families with a history of diabetes or obesity, high glucose loading may lead to early pancreatic disease and overweight. An occasional sweet following a healthy meal is sensible and harmless. But when children consistently consume sweets or junk snacks between meals they are developing an unhealthy lifestyle. Parents often express frustration at their inability to stop their children from invading the pantry despite warnings to the contrary. The solution is obvious: mom and dad must stop stocking their pantries with junk. Unless the children have a credit card, only the parents are to blame if sugary snacks are readily available in the house. Not only will a healthy house cleaning be good for the kids, it will be equally good for the parents. Carbonated soft drinks, especially colas have no redeeming value. They have the same drawbacks as sugary snacks and, worse, can result in defective calcification of the bones. Drinking soda should be avoided. If the child is thirsty, water, juice or milk should fill the bill but drinking milk or juice within three hours of the next meal will usually adversely affect the child’s appetite. What about sugar substitutes and diet drinks? Avoid them. There are no long term studies in children to assure that these compounds are safe. Never give your child anything without a long, proven record of safety. Sugar is a natural, safe form of energy. It does not cause kids to become hyperactive. However, overindulgence results in nutritional imbalance, poor eating habits and a threat to long term health.